Like its siblings designed for tablets, the DODOcase HARDcover for the iPhone 5s combines retro looks with modern functionality. The case features a book-like, high-quality fabric exterior which is offered in an overwhelming variety of colors, including ones chosen by the user. Hand-made in San Francisco using traditional book-binding techniques, DODOcase’s products preserve the age-old craft by bringing its charm to the tech world. Here’s what the HARDcover for the iPhone 5s has to offer! In person, the DODOcase HARDcover wrapped iPhone 5s looks like a miniature book. An elastic strap keeps the case closed and helps it maintain a slim profile, while DODOcase’s signature logo greets you when you flip it open. 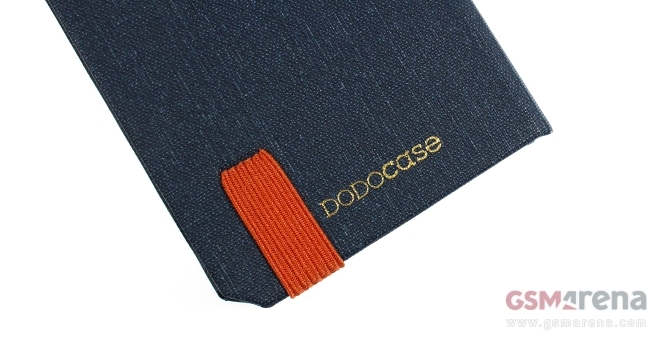 A DODOcase sign in gold or black sits on the back of the cover. DODOcase has the HARDcover ready to order in eight different colors. The case is also available in the manufacturer’s Build-a-DODO customization tool. It allows users to create their own color scheme by choosing from a variety of available colors for the outside fabric, the inside of the case, as well as the elastic strap. An option to monogram the HARDcover is also available. Overall, the HARDcover does a good job in keeping the iPhone 5s intact. The handset is attached to the case via powerful, residue-free adhesive. When closed, it protects all the edges of the device, thus ensuring that it will survive an accidental drop intact. Users however, should be careful when handling their device with the HARDcover open. It exposes the device almost entirely in a case of a drop. Ergonomics of the DODOcase HARDcover are great. The case attaches only to the back of the iPhone 5s, thus leaving its buttons and ports exposed and easy to access. The back-only DODOcase attachment solution also gives the users the ability to enjoy the superb metal build of the iPhone 5s without any obstructions. Most flip cases for the handset cover it entirely and therefore hide its good looks and premium materials. The DODOcase HARDcover for the iPhone 5s is easily one of the most characterful flip cover offerings available for the device at the moment. The case offers distinctive, user-customizable look, superb build quality and tactile feel, as well as good ergonomics – all brought to life by hand in San Francisco using traditional craftsmanship methods. All in all, the HARDcover deserves a spot in your shopping list if you are after a flip case for your iPhone 5s. DODOcase’s offering for the iPhone 5s is priced at the highly acceptable $34.95, while the user-customizable version starts at $39.95. Both are available directly from the manufacturer over here. DODOcase is offering a 20% discount over the next couple of days if you like its Facebook page, thus making HARDcover for the iPhone 5s an even sweeter proposition.